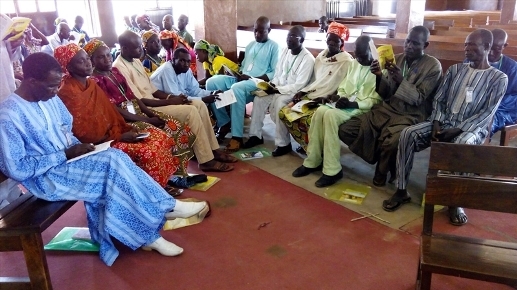 Some of the parents of the Chibok girls meet for trauma counselling with Open Doors International. Pastor Ayuba’s daughter, Amina, was among the more than 200 girls Boko Haram abducted from the Chibok State Secondary School in April 2014. Since then, Boko Haram has also burned his church and looted all of his possessions, forcing him to seek refuge with family in a different area. World Watch Monitor spoke to him about his daughter’s abduction and the difficulties Christians have been facing in north-eastern Nigeria. “Boko Haram entered [the school] by the main gate and then assembled all the ladies and told them, ‘We are not Boko Haram, we are military men’. Because they all appeared in army [uniforms], you cannot differentiate them from the soldiers. “And then they entered with big vehicles. They packed the girls in, and then moved with them to Sambisa. When they came out from the main gate, some ladies developed courage. They jumped down from the car and then began to run into the bush. They were able to escape, but [for] all those who reached Sambisa, that was the end of it. Up to now, we have not even seen one. “When I heard this thing, I really shed tears, but what can I do? The only thing I can do is give it to God. When I heard that my daughter, Amina, had been kidnapped by Boko Haram, I had not even agreed to inform my wife. I called her and said I had a call from the school that yesterday Boko Haram entered their school, but I learned that they ran into the bush. I told her, ‘I will go and then come to inform [you]’. So I went there, and after confirming, I came back and informed her what exactly had happened, but [that] we are trusting God that the soldiers … with the recommendation of the government … are doing something about it. She cried, she cried, she cried … The following day, I had to carry her to Chibok to see exactly what had happened. “So as she went there, she saw many of our colleagues, those whose children had been kidnapped together. So they cried, cried, cried, cried, cried … We wait and wait and wait, receiving many fresh promises. Up to now, we are still waiting. “We do not see anything. People agreed, we are waiting in good faith, but later we would not see any positive answer to that statement … Actually we cannot believe what the [government] are saying. “All we are trusting is God [and] that what man thinks is impossible, is possible for God. I think God who is in position, God who is in power, [can] create a way where there is no way. God will make it possible for these ladies to come out. [But] even if they do not come out, we have already put our trust in the Lord and have faith in Him. Nobody has come to stay permanently in this world. We are [going] to meet in faith before the Lord. Despite the international attention this case has enjoyed, the people of Chibok continue to face insecurity. Between November 2014 and March 2015, Boko Haram occupied their area. In April, its militants looted Ayuba’s house and burned down his church. Nothing was left standing. This forced Ayuba to seek refuge with relatives about 300 km away from Chibok.